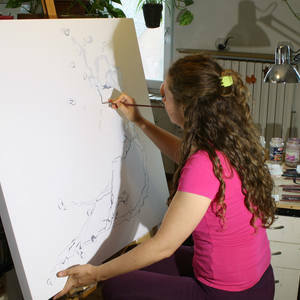 Lucia Bergamini (1984) lives and works in Asti, Piedmont. 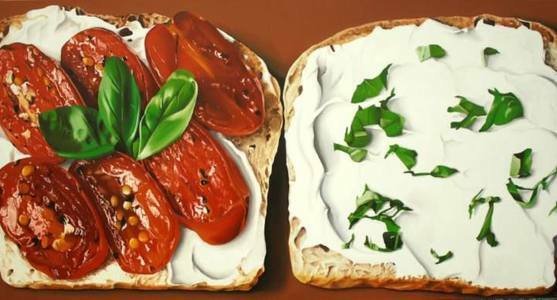 Expert in visual arts and music, using her talent to paint hyperrealist paintings with subjects culinary. In her paintings she is found mixed elements typical of her land, including food and wine and typical elements of her character, radiance, positivity and love for nature. Her hyperrealism is in the style of pop art, sort of "cartoonish", giving a hyperrealistic effect if you step back from the artwork by one or two steps; but, if you observe the painting from up close you can clearly see all the shapes of the various color patches. She likes to call her artwork "Hyperrealistic Pop". The subjects are exclusively connected to food which reflects upon the delicacies of Italian cooking with its vibrant colors and wonderful scents. Her technique, oil on canvas, is aimed at a faithful representation of the subject without exasperating detail and letting imagination complete the visual excitement , flavour and taste that her paintings pleasently cause. She likes to play with the subtle desire that rages in the observer and reproduce on the canvas the thrill and pleasure that we experience in front of culinary delights. all his canvases are turned up and stapled on the back, to make sure that the paintings can be hung without frames. Pieraccini are Italian paintings, with a thickness of 1.5 inches. She uses Rembrandt Oil colors; Rembrandt Oils are highly durable and are produced with the highest color strength possible, using valuable, costly, pure pigments. The pigments are ground to extreme fineness in a binder consisting of the purest linseed or safflower seed oil, resulting in an oil paint whose texture is exceptionally smooth, creamy, and even.